Club Dice Casino is owned by a subsidiary of ElectraWorks Limited (Gibraltar) – iGlobalMedia Entertainment Limited. It is fully licensed and regulated by the Government of Gibraltar. The casino is managed by Global Gaming Net (GGN). The casino supports play in multiple languages including English, Dutch, French, German, Italian, Japanese, Norwegian, Polish, Portuguese, Spanish and Swedish. Club Dice Casino is powered by the online casino software provider, Playtech. It is available in a downloadable version, as well as an instant flash version. You can find all of your favorite table games, card games, slots games, video poker, arcade games and progressive games at Club Dice Casino. Games include blackjack, baccarat, craps, sic bo, American roulette, European roulette, roulette pro, keno, pop bingo, tequila poker, Caribbean poker and more. 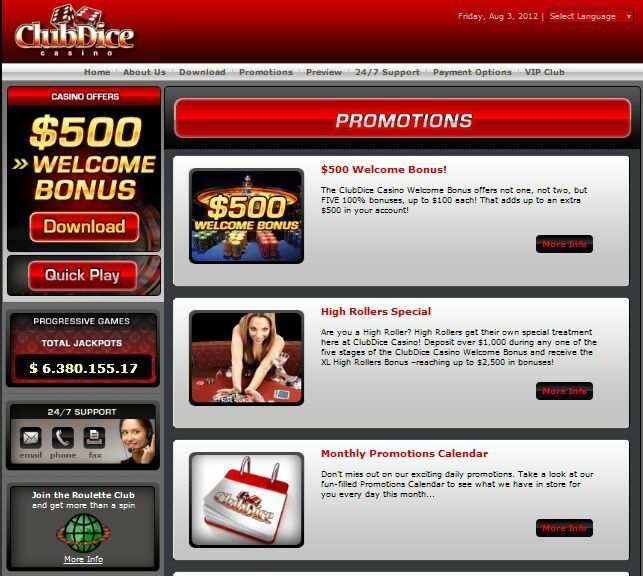 New customers at Club Dice Casino are eligible for a $500 welcome bonus package divided over their first five deposits. For each of your first five deposits at the casino you will be eligible for a 100% match deposit bonus up to $100. High rollers can earn up to $2,500 over their first five deposits. If you deposit between $1,000 and $1,499 on any of your first five deposits you will be eligible for a $300. If you deposit $1,500 or more on each of your first five deposits you will be eligible for a $500 bonus on each deposit. If you make a deposit using an alternative payment method you will be eligible for an extra 15% deposit bonus or a 100% coupon. If you invite a friend to play at the casino you will be eligible for a $25 bonus when they make their first deposit at the casino. Club Dice Casino runs daily promotions during every calendar month. These exciting promotions are only available to registered players who receive the promotional emails from the casino. 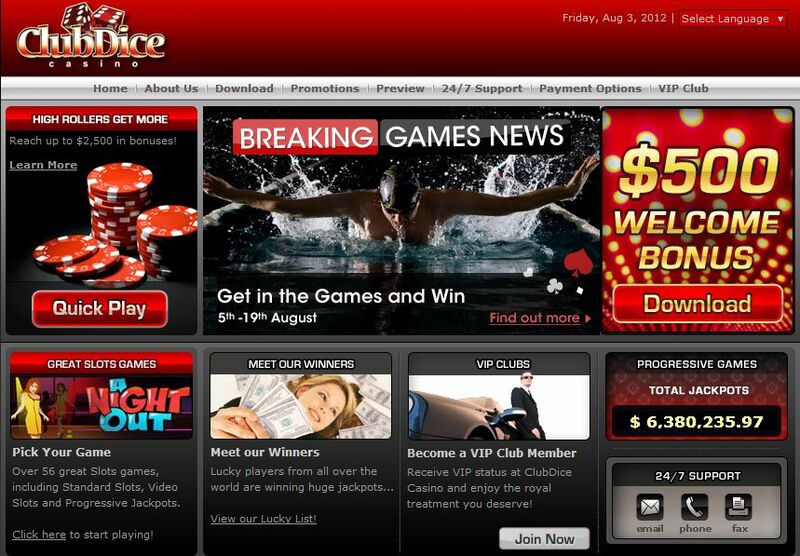 The VIP Club for Club Dice Casino rewards its members through exclusive bonuses and promotions. You can also enjoy preferential comp point conversion rates, 24 personalized customer service support and an account manager. There are three tiers in the VIP program – emerald, diamond and black diamond. All players earn comp points as they play at the casino and once accumulated these points can be redeemed for cash. If you have any queries when playing at Club Dice Casino you can contact customer service support 24 hours a day, seven days a week. They can be contacted via email, telephone, fax and instant live chat. Chat can be found by clicking on the “online support” icon in the casino lobby. There are many safe and convenient payment options available at Club Dice Casino. Payment options include VISA, Master Card, VISA Electron, Maestro, Solo, Delta, NETeller, Entropay, Moneybookers, Click2Pay, InstaDebit, myCitadel, Paysafe Card, ClickandBuy, Ukash, Webmoney, iDEAL, POLi, Przelewy24, Sofort, direct bank transfer, GiroPay, CartaSi, PostePay, Nordea, Laser and Ticket Premium. Deposits can be made in US dollars, UK pounds, euro and South African rand.